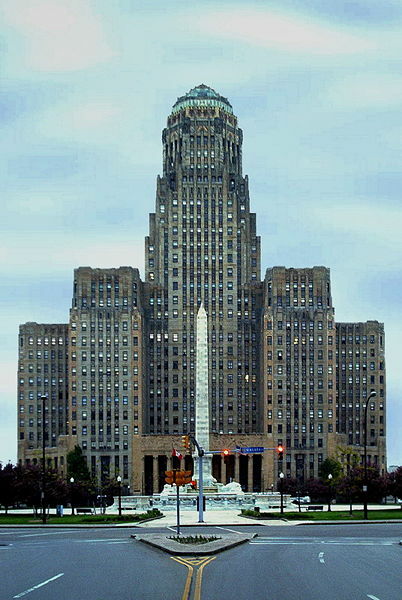 The Art Deco spire of the Chrysler Building, built 1928-1930 City Hall of Buffalo, New York, an art-deco building. 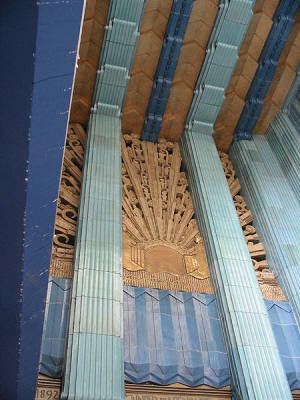 Terra cotta sunburst design in gold behind sky blue and deep blue above the front doors of the Eastern Columbia Building in Los Angeles. 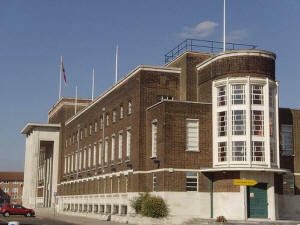 Architects: Ellis and Clarke with Sir Owen Williams, 1930-32, with interiors designed by Robert Atkinson. 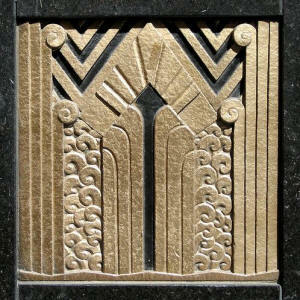 Art Deco Ornament- Art Deco ornamentation in the door reveal of the Carbide and Carbon Building on North Michigan Avenue in Chicago, Illinois. Helsinki Expressionist Art Deco- The Finland Station. 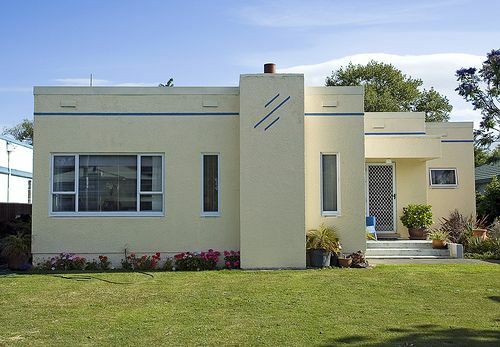 Art Deco House, Napier, New Zealand. London art deco: Dagenham Civic Centre, 1936, architect: E Berry Webber. 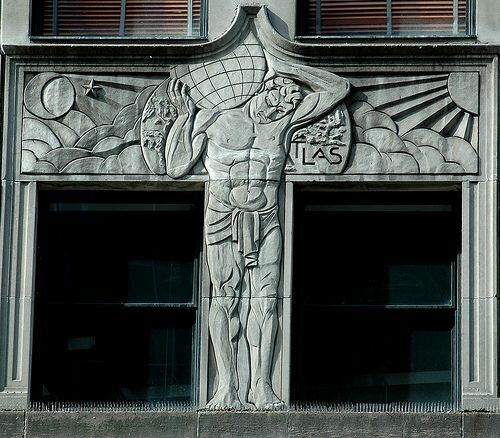 Art Deco Atlas- Art Deco bas relief of Atlas from the facade of the landmark McGraw Hill Building on North Michigan Avenue in Chicago, Illinois. 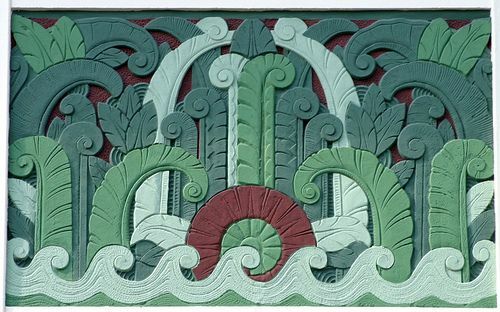 Art Deco Design / Lincoln Road in Miami Beach, FL Salvaged art deco ornamental panel, Chicago, Illinois. 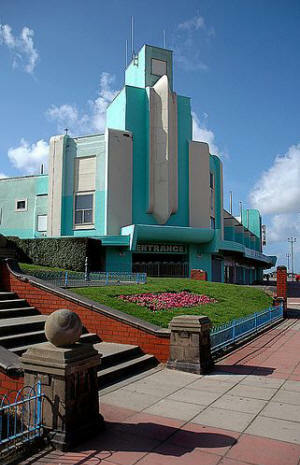 Miami Beach, FL Brighton, UK- the stunning art deco of new brighton best recognised by the now bright spot amusements centre. Madrid's Warner Theme Park has an area (next to main entry) whose buildings are designed in Art Deco / Raygun Gothic style. 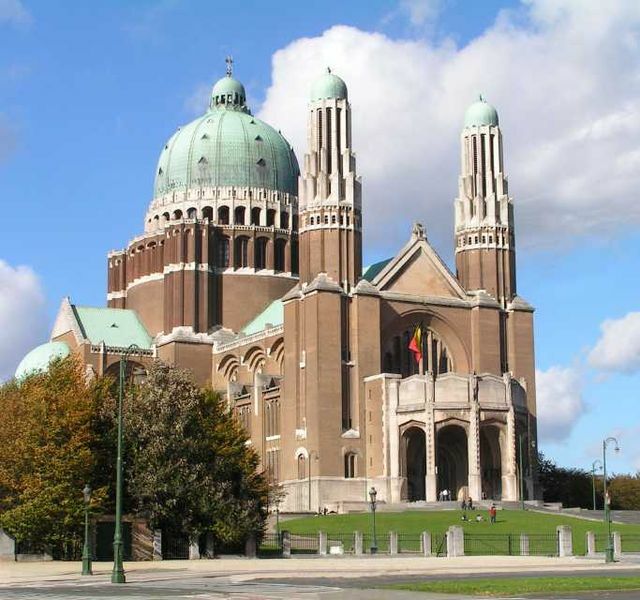 National Basilica in Brussels styles itself the largest Art Deco church in the world. Albert Van Huffel, 1905. 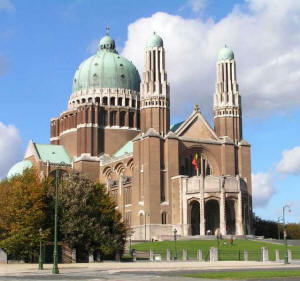 The Cathedral of Mary Our Queen, Baltimore, Maryland. 1954. 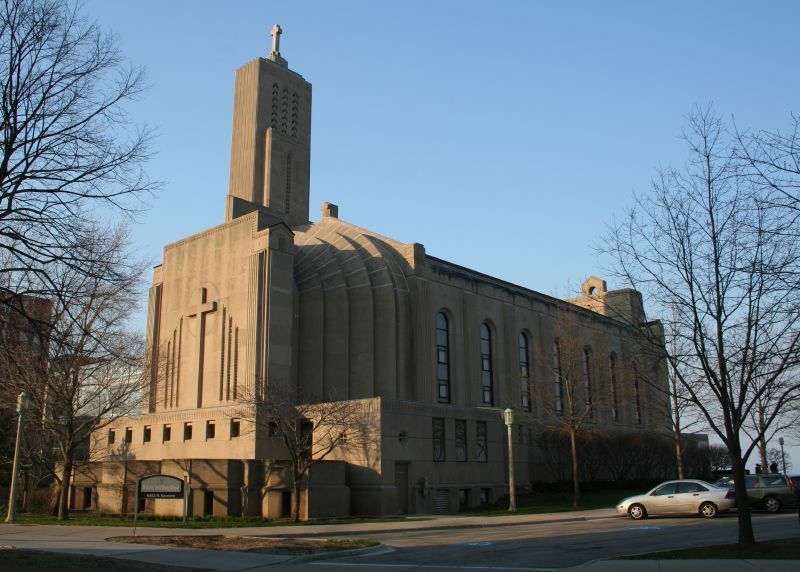 Madonna della Strada chapel in Chicago. 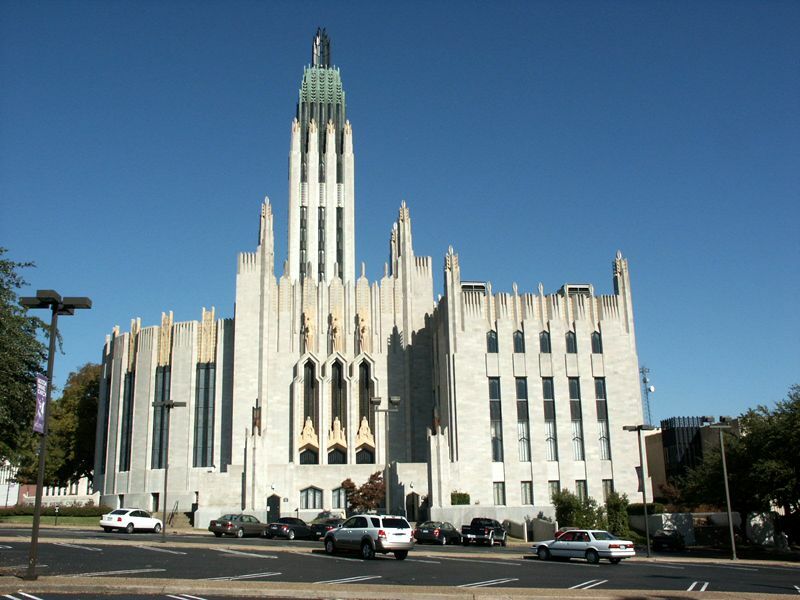 Boston Avenue United Methodist Church, located in downtown Tulsa, Oklahoma. Saint Pierre Cathedral, Rabat, Morrocco. Art Deco was a popular international design movement from 1925 until 1939, affecting the decorative arts such as architecture, interior design, and industrial design, as well as the visual arts such as fashion, painting, the graphic arts and film. This movement was, in a sense, an amalgam of many different styles and movements of the early 20th century, including Neoclassical, Constructivism, Cubism, Modernism, Art Nouveau, and Futurism. Its popularity peaked in Europe during the Roaring Twenties and continued strongly in the United States through the 1930s. Although many design movements have political or philosophical roots or intentions, Art Deco was purely decorative. At the time, this style was seen as elegant, functional, and modern. 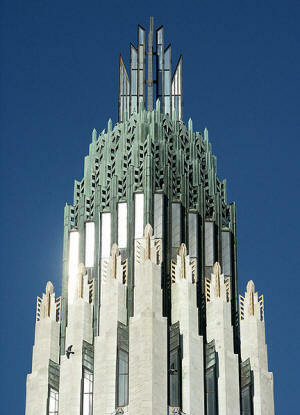 Art Deco experienced a decline in popularity during the late 30s and early 40s, and soon fell out of public favor. It experienced a resurgence with the popularization of graphic design in the 1980s. 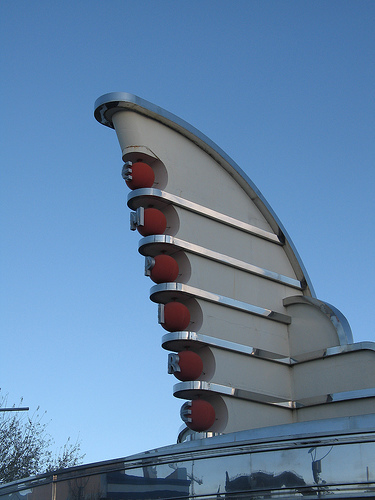 Art Deco had a profound influence on many later artistic movements, such as Memphis and Pop art. Surviving examples may still be seen in many different locations worldwide, in countries as diverse as the United Kingdom, Cuba, the Phillipines, and Brazil. 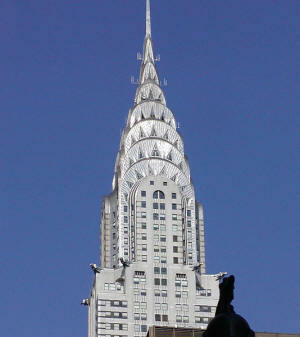 Many classic examples still exist in the form of architecture in many major cities. 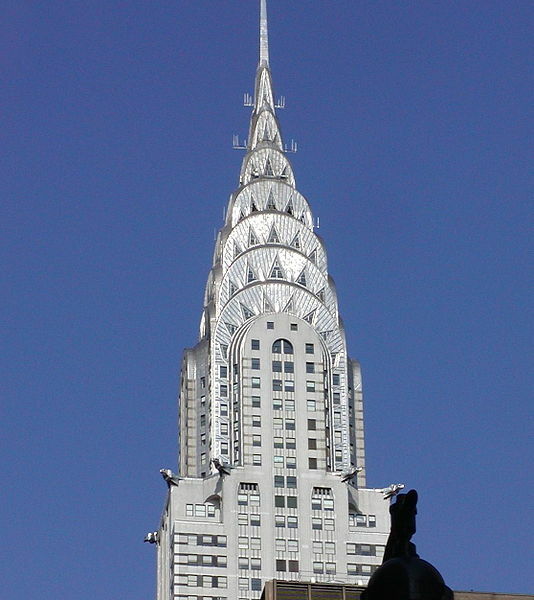 The Chrysler building, designed by William Van Alen, is a classic example of this, as it is one of the most notable examples of Art Deco architecture today. After the Universal Exposition of 1900, various French artists formed an informal collective known as, La Société des artistes décorateurs (the society of the decorator artists). Founders included Hector Guimard, Eugène Grasset, Raoul Lachenal, Paul Follot, Maurice Dufrene, and Emile Decour. These artists heavily influenced the principles of Art Deco as a whole. This society's purpose was to demonstrate French decorative art's leading position and evolution internationally. They organized the 1925 Exposition Internationale des Arts Décoratifs et Industriels Modernes (International Exposition of Modern Industrial and Decorative Art) in Paris, which would feature French art and business interests. The terms Style Moderne and Art Deco both derive from the exposition's title, though Art Deco was not widely used until popularized by art historian Bevis Hillier's 1968 book Art Deco of the 20s and 30s. 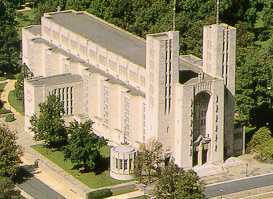 In the summer of 1969, Hillier conceived organizing an exhibition called Art Deco at the Minneapolis Institute of Arts, which took place from July to September 1971. After this event, interest in Art Deco peaked with the publication of his 1971 book The World of Art Deco, a record of the exhibition. 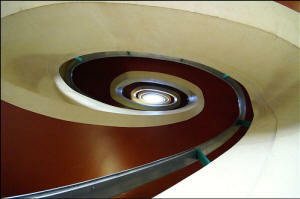 The structure of Art Deco is based on mathematical geometric shapes. It was widely considered to be an eclectic form of elegant and stylish modernism, being influenced by a variety of sources. Among them were the so-called "primitive" arts of Africa, Ancient Egypt, and Aztec Mexico. 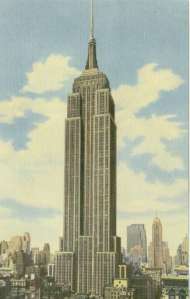 It also drew on Machine Age or streamline technology, such as modern aviation, electric lighting, the radio, the ocean liner and the skyscraper for inspiration. 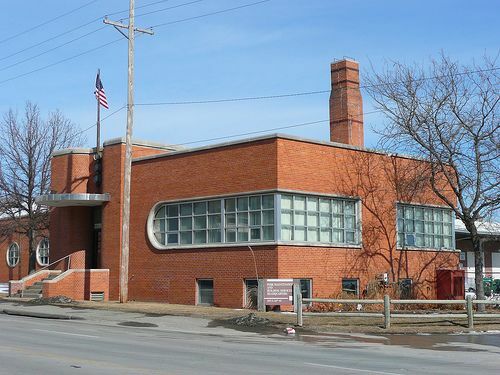 It is in streamline modern styles that this technology fully manifests itself and, although it is not antithetical to Art Deco, it is now considered to be a separate architectural style. 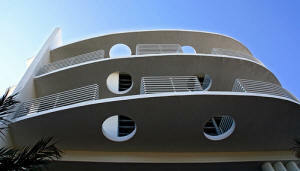 Art Deco design influences were expressed in the crystalline and faceted forms of decorative Cubism and Futurism. Other popular themes in Art Deco were trapezoidal, zigzagged, geometric, and jumbled shapes, which can be seen in many early pieces. Two great examples of these themes and styles are in Detroit, Michigan: the Fisher Building and the Guardian Building. Art Deco was an opulent style, and its lavishness is attributed to reaction to the forced austerity imposed by World War I. 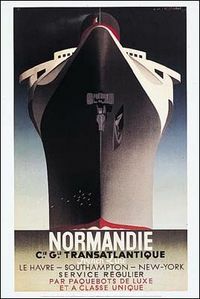 Its rich, festive character fitted it for "modern" contexts, including the Golden Gate Bridge, interiors of cinema theaters (a prime example being the Paramount Theater in Oakland, California) and ocean liners such as the Île de France, the Queen Mary, and Normandie. Art Deco was employed extensively throughout America's train stations in the 1930s, designed to reflect the modernity and efficiency of the train. The first Art Deco train station in the United States was the Union Station in Omaha, Nebraska. 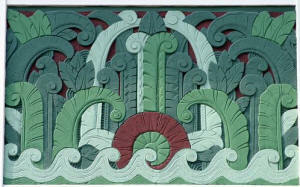 Art Deco made use of many distinctive styles, but one of the most significant of its features was its dependence upon a range of ornaments and motifs. The style is said to have reflected the tensions in the cultural politics of its day, with eclecticism having been one of its defining features. In the words of Scott Fitzgerald, the distinctive style of Art Deco was shaped by 'all the nervous energy stored up and expended in the War'. 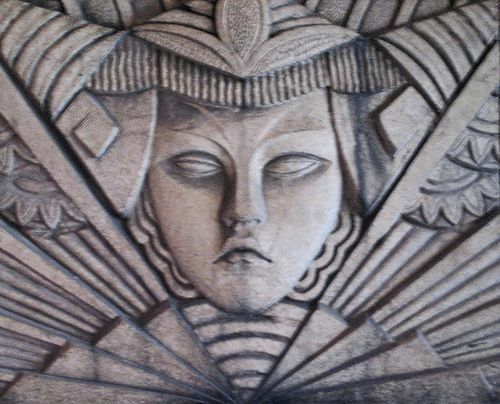 Art Deco has been influenced in part by movements such as Cubism, Russian Constructivism and Italian Futurism, which 'are all evident in Art Deco decorative arts'. 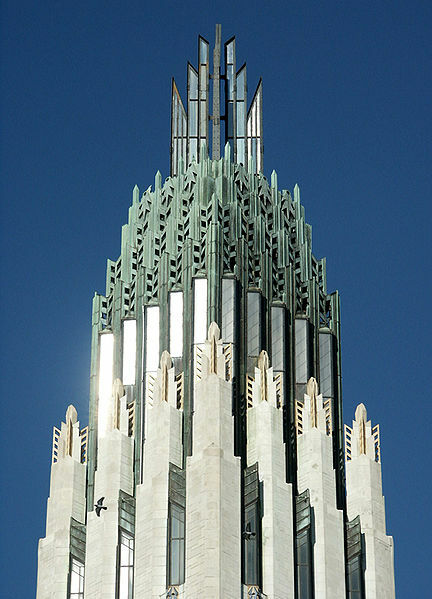 Art Deco is characterized by use of materials such as aluminium, stainless steel, lacquer and inlaid wood. Exotic materials such as sharkskin (shagreen), and zebraskin were also in evidence. The bold use of stepped forms and sweeping curves (unlike the sinuous, natural curves of the Art Nouveau), chevron patterns, and the sunburst motif are typical of Art Deco. 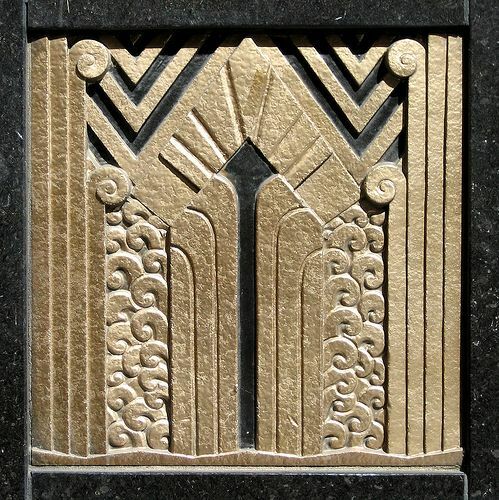 Some of these motifs were ubiquitous — for example, sunburst motifs were used in such varied contexts as ladies' shoes, radiator grilles, the auditorium of the Radio City Music Hall, and the spire of the Chrysler Building. Art Deco slowly lost patronage in the West after reaching mass production, when it began to be derided as gaudy and presenting a false image of luxury. Eventually, the style was cut short by the austerities of World War II. 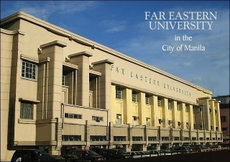 Before destruction in World War II, Manila possessed many Art Deco buildings; a legacy of the American colonial past. A resurgence of interest in Art Deco came first in the 1960s, and then again in the 1980s with the growing interest in graphic design, where its association with film noir and 1930s glamour led to its use in advertisements for jewelry and fashion. 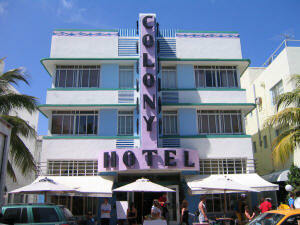 Some of the finest surviving examples of Art Deco art and architecture are found in Cuba, especially in Havana. 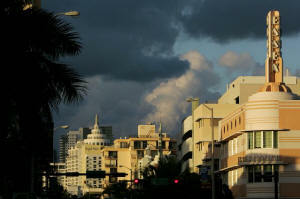 The Bacardi Building is noted for its particular style, which echoes the classic themes of Art Deco. The style is expressed in the architecture of residences, businesses, hotels, and many pieces of decorative art, furniture, and utensils in public buildings, as well as in private homes. Another country with many examples of rich Art Deco architecture is Brazil, specially in Goiânia and cities like Cipó (Bahia), Iraí (Rio Grande do Sul) and Rio de Janeiro, especially in Copacabana. 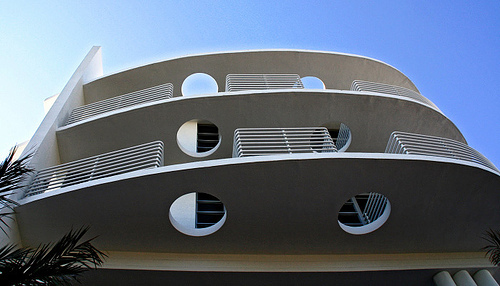 Also in the Brazilian Northeast — notably in countryside cities, such as Campina Grande in Paraiba State — there is a noticeable group of Art Deco buildings, which has been called “Sertanejo Art Deco” because of its peculiar architectural features. The reason for the style being so widespread in Brazil is its coincidence with the fast growth and radical economic changes of the country during 1930-1940. 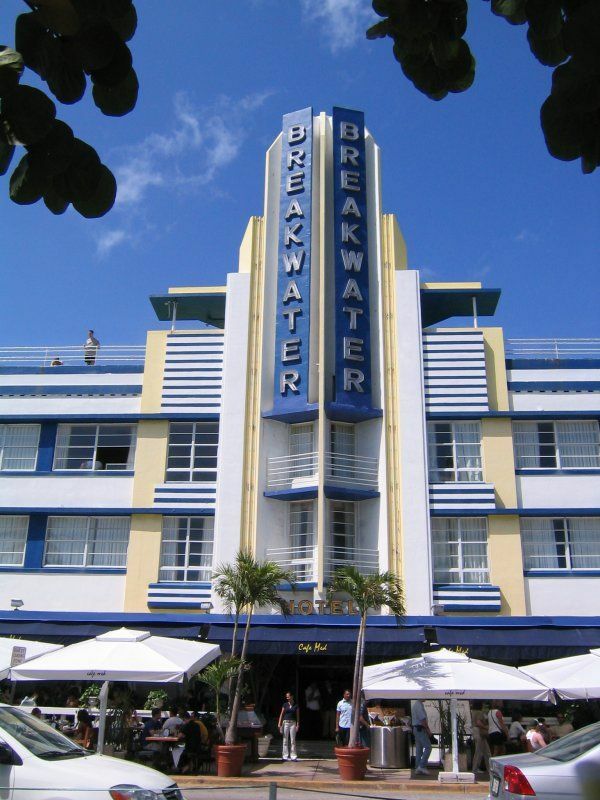 South Beach in Miami Beach, Florida has the largest collection of Art Deco architecture remaining in North America. 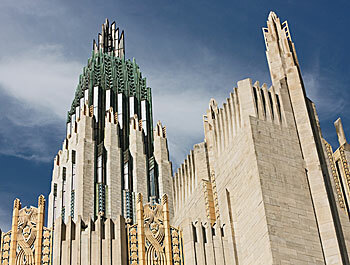 Much of the Art Deco heritage of Tulsa, Oklahoma remains from that city's oil boom days. 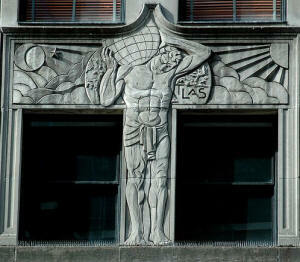 Houston, Texas has some surviving art deco buildings, although many are threatened by modern development. Some examples are the Houston City Hall building, the J.P. Morgan Chase building and the 1940 Air Terminal Museum which is housed in the original airport terminal. Napier, New Zealand, was rebuilt in the Art Deco style after being largely razed by an earthquake in 1931. 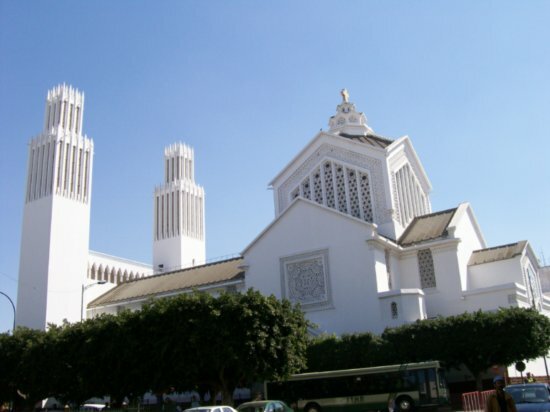 Although a few Art Deco buildings were replaced with contemporary structures during the 1960s, 1970s and 1980s, most of the centre remained intact for long enough to become recognized as architecturally unique, and from the 1990s onwards had been protected and restored. As of 2007, Napier has been nominated for UNESCO World Heritage Site status, the first cultural site in New Zealand to be nominated. 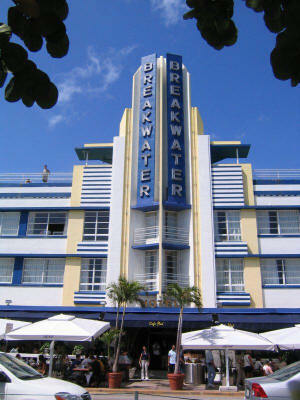 The distinctive style of Art Deco has been echoed in many similar movements since its early decline. 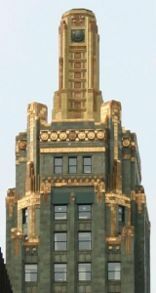 Art Deco influenced later styles such as Memphis and the Pop art movement. 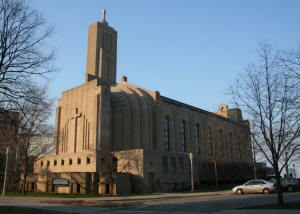 It also had an effect on post modern architecture and styles, even through to the late 1970s. Art Deco has also had a marked influence on contemporary design. During the 1930s, Art Deco had a noticeable influence on house design in the United Kingdom, as well as the design of various public buildings. Straight, white-rendered house frontages rising to flat roofs, sharply geometric door surrounds and tall windows, as well as convex curved metal corner windows, were all characteristic of that period. Art Deco (French: Exposition Internationale des Arts Décoratifs et Industriels Modernes) was a twentieth century movement in the decorative arts, that grew to influence architecture, design, fashion and the visual arts. The name Art Deco derived from the Exposition Internationale des Arts Décoratifs et Industriels Modernes, a World's fair held in Paris, France in 1925, though the term was not used prior to the late 1960s. 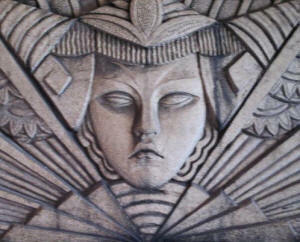 Art Deco was influenced by many different cultures, particularly pre-World War I Europe. The movement occurred at the same time, and as a response to, the rapid social and technological advances of the early 20th century. Paris was at the center of the high end of Art Deco design, epitomized in furniture by Jacques-Emile Ruhlmann, the best-known of Art Deco furniture designers and perhaps the last of the traditional Parisian ébénistes, and Jean-Jacques Rateau, the firm of Süe et Mare, the screens of Eileen Gray, wrought iron of Edgar Brandt, metalwork and lacquer of Jean Dunand, the glass of René Lalique and Maurice Marinot, clocks and jewelry by Cartier. Early work and thinking of the Weimar Bauhaus in its expressionist phase. 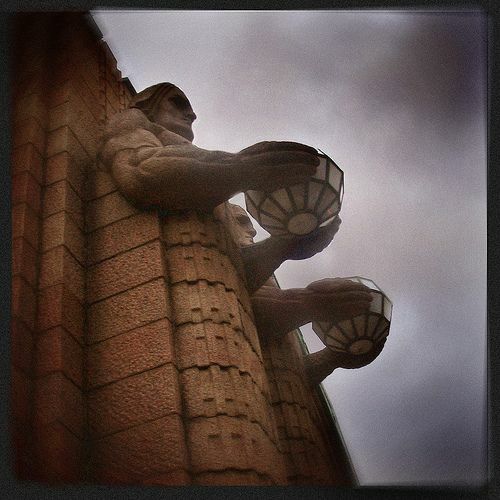 Ancient Greek sculpture and ceramic design of the less naturalistic "archaic period"
Everything associated with Jazz, Jazz Age or "jazzy"
Machine age technology such as the radio and skyscraper. 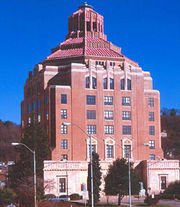 Asheville, North Carolina City Hall, 1926–1928 epitomizes the American Art Deco style. Corresponding to these influences, Art Deco is characterized by use of materials such as aluminum, stainless steel, lacquer, inlaid wood, sharkskin (shagreen), and zebraskin. The bold use of zigzag and stepped forms, and sweeping curves (unlike the sinuous curves of the Art nouveau), chevron patterns, and the sunburst motif. Some of these motifs were ubiquitous — for example the sunburst motif was used in such varied contexts as a lady's shoe, a radiator grille, the auditorium of the Radio City Music Hall and the spire of the Chrysler Building. Art Deco was an opulent style and this lavishness is attributed to reaction of the forced austerity caused by World War I. Its rich, festive character fitted it for "modern" contexts including interiors of cinema theaters and ocean liners such as the Ile de France and Normandie. A parallel movement called Streamline Moderne or simply Streamline followed close behind. Streamline was influenced by manufacturing and streamlining techniques arising from science and the mass production shape of bullet, liners, etc., where aerodynamics are involved. Once the Chrysler Air-Flo design of 1933 was successful, "streamlined" forms began to be used even for objects such as pencil sharpeners and refrigerators. 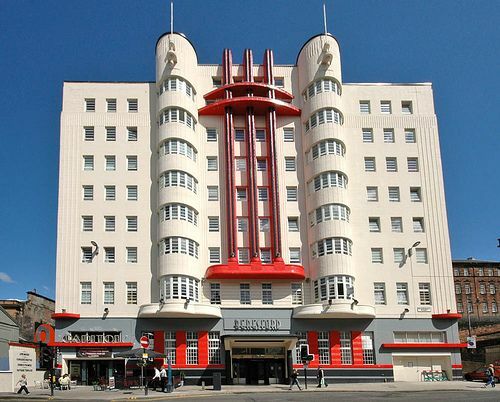 Art Deco slowly lost patronage in the West after reaching mass production, where it began to be derided as gaudy and presenting a false image of luxury. Eventually the style was cut short by the austerities of World War II. In colonial countries such as India, it became a gateway for Modernism and continued to be used well into the 1960s. A resurgence of interest in Art Deco came with graphic design in the 1980s, where its association with film noir and 1930s glamour led to its use in ads for jewelry and fashion.